What is a monopoly? Continuing the market structure discussion - FreeEconHelp.com, Learning Economics... Solved! A monopoly exists when there is only one seller of a good, and that good has no close substitutes. For this reason, a monopoly is considered the opposite of perfect competition. 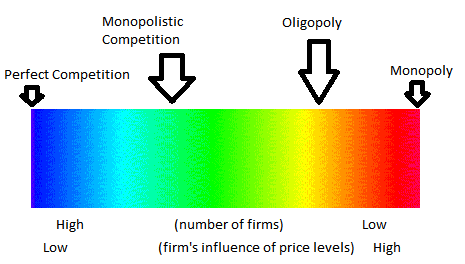 If you were to imagine the different market structures as a continuum, then perfect competition and monopoly would be on opposite sides, with various forms of monopolistic competition and oligopolies in the middle. 1. Only one firm sells a product or good. 2. There are no close substitutes to that good. 3. There are barriers to entry protecting the monopoly from competition. Monopolies may form naturally because of economic conditions or may be a result of government regulation. Economic conditions can cause monopolies to form because of the presence of increasing economies of scale, or because they have control over the supply of raw materials. Government regulation can create monopolies through the use of patents, or the creation of government franchises. The most common examples of monopolies which we deal with are utility companies. In particular think about how you purchase your electricity, water, and cable TV. For most places it makes sense to have only one company provide electricity, and this is because they enjoy economies of scale. This means that the marginal cost of producing the next unit of power is cheaper than the last. If one company can produce things cheaper, than several companies can together, why would we want MORE than one company? This is why these types of businesses generally get permission to run their monopoly from the government, but is likewise heavily regulated. Monopolies have to be regulated, because essentially, they alone are the supply side of the market. This means they get to dictate how much will be supplied to the market, and therefore what the price will be. This means that monopolies will directly interact with the demand function. Their goal will be to increase production/output until the marginal cost of production is set equal to their marginal revenue. An easy way to remember the properties of a monopoly is to consider the class game monopoly. What is the point of the game? You want to buy up all of the similar properties so that your opponent has to pay a higher price! This is exactly what goes on in the real world. By buying up all similar substitutes (same colored properties) then the players have no choice but to pay your high prices!